If you want a good rank in the search engines, then you need to take your SEO seriously. Luckily, using WordPress puts you ahead, as it’s already pretty SEO friendly right out of the box. It’s one of many reasons people choose WordPress in the first place. Still, there are a number of things you can do to take WordPress SEO to the next level. To make it easy on you we’ve created this guide. Below you’ll learn 30 of the best tips you can use to improve your site’s traffic. WordPress already has some pretty solid built-in SEO features. But, you can take your optimization to the next level by using an SEO plugin. The best SEO plugin on the market is Yoast SEO, in fact, it’s what we use here at Hostinger. With this plugin, you can perfectly optimize each page and post for your chosen keyword. It also has built-in analysis based on the latest algorithm updates. You can even generate an XML sitemap, and add schema markup to your site. To setup Yoast navigate to your WordPress dashboard and select Plugins › Add New. In the search bar type in ‘Yoast SEO’ and click ‘Install Now’ on the plugin that looks like the one below. Finally, click ‘Activate’ once it pops up. The plugin is now running on your site, and you can access it by clicking on the SEO icon on the left-hand menu. You may also check our in-depth guide on how to use Yoast SEO plugin to the maximum potential. Create content your visitors are actually searching for. Develop a better understanding of the needs of your market. Track the success of everything you write. Generate valuable traffic for your site. There are a variety of tools that will help you with keyword research. Some of the top tools include KWFinder, SEMRush, and even the Google Keyword Planner. Create a list of target keywords related to your topic. Input them into a keyword research tool to uncover keywords that receive a decent volume of traffic, and have lower competition. Research competitors by running similar sites through keyword research tools to see which keywords bring them the most traffic. See which of these keywords have a low enough competition where you can compete. With your keyword list created it’s time to start creating content and optimizing it with the tips on this list! There’s a built-in option within WordPress that will hide your site from the search engines. You might find this option useful when first building out your site, but it can make ranking impossible. If you’ve been employing some of the tips on this list, but aren’t seeing your rankings improve, this could be the issue. To see if this setting is on, navigate to Settings › Reading from within the WordPress dashboard. Scroll down and you’ll see a section called Search Engine Visibility. Make sure that you leave this box unchecked. Then click ‘Save Changes’. When you first install WordPress your site’s pages and posts will have a strange URL structure. This default structure isn’t good for your SEO. The cleanest and most search engine friendly URL structure is the “post name” setting. By switching to this setting you’ll also be able to include your post or page title, and even a keyword in your URL. To change this setting navigate to Settings › Permalinks. Under the ‘Common Settings’ section, select the option that says ‘Post name’. If you’re making this change late in the game, then you may need to redirect any old URLs. You can do this with a plugin like Change Permalink Helper. Just input your older URLs and they’ll forward to your updated URLs. Using Google Search Console will show you how your site is currently performing in the search engines, and alert you to any sitewide errors. To add your site to Google Search Console first navigate to this page and sign up with your Google account. Next, click on the ‘Add A Property’ button and enter your website’s URL. Click ‘Add’, and you’ll be taken to a screen where you’ll need to verify the ownership of your site. There are multiple methods you can use to verify your site, but the easiest is selecting Alternate methods, then choosing HTML tag. Copy this code, then navigate to your WordPress dashboard. To add this code to our header we’re going to utilize a plugin. Navigate to Plugins › Add New, then search for ‘Insert Headers and Footers‘. Install and activate the plugin shown in the picture above. Next, open up the plugin by going to Settings › Insert Headers and Footers. Now paste the code into the box that’s labeled Header, and click ‘Save’. Finally, navigate back to Google Webmaster Tools and click the Verify button. Another Google tool you’ll want to have in your arsenal is Google Analytics. This tool will show you how well your SEO strategy is working by giving you an in-depth breakdown of your site’s traffic. Depending on your theme you might have an option to directly add the Google Analytics tracking code. If it’s not possible, then you can use the same Insert Headers and Footers plugin we used above. Open up the plugin, navigate to the header section, and paste in your tracking code. That’s it! Now you can view your site’s statistics. For more detailed instructions, you may also check our step-by-step guide on how to add Google Analytics to WordPress. Sitemaps are used by the search engines to better crawl your website. Your site will still get crawled without a sitemap, but creating one allows you to report the data that you want the search engines to crawl. You can ensure certain pages that don’t contribute to your rankings aren’t crawled, as well as give precedence to your more valuable pages. If you’re using the Yoast SEO plugin, then you can easily create and submit a sitemap. Navigate to SEO › General › Features. Then scroll down and enable ‘XML Sitemaps‘. Click the link that says ‘See XML sitemap’ and this will open your sitemap to ensure it’s actually created. Now we’ll submit that sitemap to Google. Go to your Google Search Console dashboard and click ‘Sitemaps’. 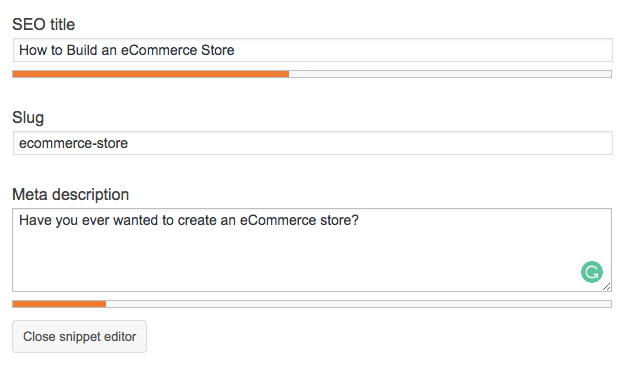 In the right-hand corner, you’ll see an option to Add/Test Sitemap. Click that selection, insert the URL of your sitemap, and click ‘Submit’. Now Google will crawl your sitemap on a regular basis, which can help for speedy post indexing. Google just announced that they’re starting to test their mobile-first index. This means that they’ll start to use the performance and functionality of your mobile pages to determine your rankings. So, if you aren’t utilizing an unresponsive theme, this is the best time to fix it up. But, beyond choosing a responsive theme you can check to see how your site currently performs across the mobile spectrum. To do this, open up Google’s mobile-friendliness test, and enter your site’s URL. This will give you a breakdown of how the mobile version of your site performs and offer some tips on how to improve it. Website speed has always been important. Having a slow loading website will negatively impact your rankings and user experience. Page speed is even on its way towards becoming a ranking factor. First, you’ll need to get an idea of how your site is actually performing. Open up a tool called GTMetrix and run your site through the tool. This will give you a breakdown of your current performance numbers, so you can see what you need to improve. Sometimes, misconfiguration from the server side can cause slowness. This is why choosing a correct web hosting environment is important. For the WordPress site performance, we recommend going with a WordPress-specific hosting package that’s custom-tailored to your site’s setup. A CDN will help to speed up your site by storing versions of your site on servers across the globe. That way when a visitor lands on your site, they’ll get the version that’s closest to their physical location. For a reliable free solution, you can integrate your site with a CDN like Cloudflare. A caching plugin will generate static HTML files, instead of the PHP files normally required to run WordPress. This will minimize the number of requests between the server and your user’s browser, which will decrease your loading speeds. Some of the most common WordPress caching plugins include W3 Total Cache and WP Super Cache. If you’re uploading images to your site, then these need to be properly optimized. Reduce the file size by running your images through a tool like TinyPNG. Install an image optimization plugin like WP Smush. Having a lot of broken links isn’t good for your readers or your rankings. Also, they make it harder for the Google bots to crawl your site. The easiest way to check your site for broken links is to open up Google Search Console and click on ‘Crawl Errors’. Then, open up each error and it’ll show you where the broken link is, so you can fix it. Even though the way we optimize for keywords has changed, they still play an important role in SEO. Whenever you’re writing a post on your site you should have a focus keyword for that specific post. Don’t overstuff the keyword into your post, only include when it’s natural. Include your keyword in the first paragraph of your copy if possible. Use your target keyword in your title and your subheadings. Add your target keyword to your URL, and meta description. Yoast SEO makes implementing the above tips easy. Whenever you’re writing a post input your target keyword into the tool. You’ll get an analysis of how well-optimized that post is for your chosen keyword. You’ll be given tips to improve your keyword optimization and increase your chances of ranking in the search engines. The content is generally longer and has high content standards. The content satisfies search intent. Long, well-written content is great. But, you might not know what search intent is. At the core, search intent is the intention behind the keyword phrase. When you’re creating any kind of content you should research what’s currently ranking, and try to understand why it’s ranking. Sometimes, the content will be ranking off the strength of the domain alone. But, if every site has a similar amount of authority, then the content itself will be the differentiating factor. Is the searcher looking for information or product content? Are they looking for something in-depth? Or a short read? Why are the current pages ranking? What style of content will best answer the keyword? With a better understanding of the keyword, the pages that rank well, and what the searcher wants, you’ll be ready to create a piece of epic content. Longer content tends to rank better in the search engines. Recent studies from Buzzsumo and Moz found that longer content gets more social shares and backlinks overall, which means higher rankings. Another study has found that most of the content that’s ranking on the first page of Google is over 2000 words long. This doesn’t mean every post on your site has to reach this content length, but it should be something you shoot for. But, this doesn’t mean you should stuff your content with unnecessary words to hit your word count goals. Instead, you should focus on the intent of the keyword. Meaning, what’s the reason the user is searching for that keyword in the first place. Then, answer the goal of that keyword in the most thorough and useful manner possible, which in some cases might mean writing fewer words. Evergreen content can be a powerful driver of traffic. This style of content will always be relevant as it doesn’t rely on timely information. Think a post like, ‘The Ultimate Guide to Onsite SEO‘, versus something like ‘What You Need to Know About Google’s Latest Update‘. The first will be relevant for a long time, while the second will rely upon a time-based information. This doesn’t mean you publish your evergreen content once and forget about it forever. But instead, you regularly update the content to reflect the latest and most relevant aspects of your industry or topic. Evergreen content is valuable in that it doesn’t lose its relevancy. This means you can continually share, promote, and pick up backlinks to this content. This style of content will typically hold down top ranking positions for years. Even though evergreen content will take more time and effort to create, the results will pay off for years to come. Linking out to high-quality sources won’t hurt your SEO, in fact, it might actually help it. When you link out to high-quality authoritative sources you’re letting Google know that the linked content is similar to yours. Plus, it enhances the user experience, by providing readers with more information on the topic. Don’t let your site become a dead end on the internet, sharing the link love is a good thing. Make it a regular practice to link out to helpful sources, as it’ll help to improve your own credibility and trustworthiness. By linking out to others it also gives you a reason to reach out and start a dialogue. Then, click the gear icon, which will bring up your link options. 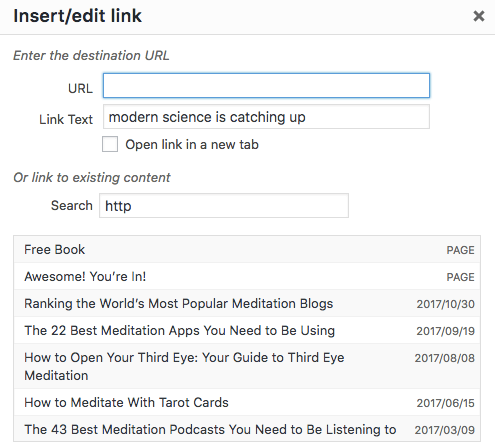 A text box will appear and then select the box that says ‘Open link in a new tab’. Now, whenever a user clicks on the link it’ll open up in a new tab, instead of being redirected off your site. Keeping visitors on your site longer by visiting more pages, thus reducing bounce rate, improving time on site. 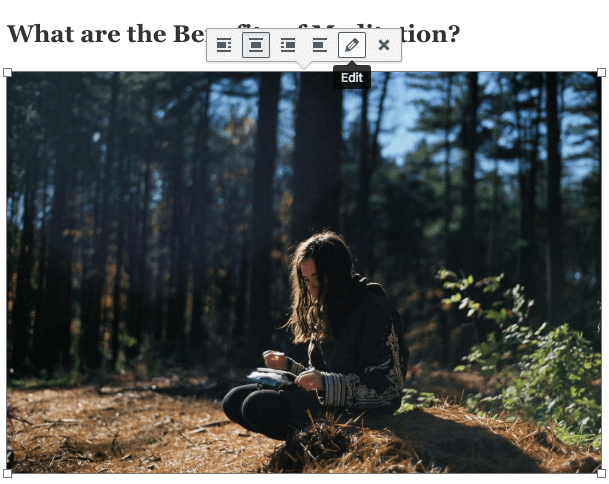 WordPress makes it easy to interlink your content together. Whenever you’re writing a post, just highlight a portion of text and click the hyperlink button. Then, select the gear icon, bringing up your link options. In the pop-up window, you’ll see a list of previous posts you’ve written. Just select the most relevant piece of content from the list. Your title tag is your most important heading tag. It tells Google what your page is about, and will influence whether readers will click through to your site. If you’re not sure which tag is your title tag, it’s the name of your post or page. Include your target keyword as early in the title as possible. Create a title tag between 60 to 70 characters. Create an enticing title that gets people to click. Changing your title tag to something well-optimized and clickable is quite easy. Especially if you’re using the Yoast SEO plugin. To change your title tag open up one of your posts and scroll to the bottom. You’ll see a section called ‘Snippet editor’. Here, you’ll be able to adjust your SEO title and optimize it to rank. Your header tags will give the crawler bots an idea of what your content is about. Using these tags throughout your content will make it more readable and well-optimized for the search engines. In general, you should have one H1 tag per post and use a hierarchy of H2, H3, H4, etc., underneath that. Your H1 tag will also be the title of your post, so you’ll definitely want to include your target keyword. For the rest of your header tags use a variation of your target keyword, if possible. However, don’t stuff your heading tags with keywords if it doesn’t make sense for your post. 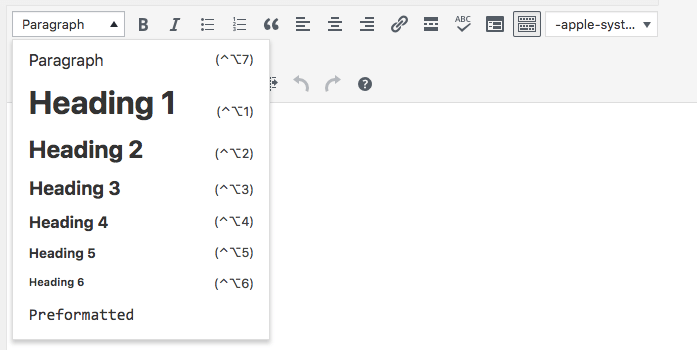 Within the WordPress editor, you can easily add header tags via the drop-down menu. When it comes to your URLs, the shorter the better. Do your best to shorten your URLs, so they don’t show multiple categories or directories. Try to only include your target keyword, and get rid of everything else. A long URL won’t penalize your rankings. But it could make your link look like a spam link and lower the CTR. If you changed your permalinks, this will help to give you more control over your URL structure. Your meta description is the bit of text that’s below the title in the search results. It gives searchers an idea of what that page is going to be about. Your meta description isn’t a direct ranking factor, but it will help to improve your search engine CTR. A well-written and enticing meta description will drive the searcher to click on your post, instead of the other search results. The data is correlation based, but if you have a high CTR, Google will deem your page more relevant, which could improve your rankings. Include your focus keyword in your description. Google will highlight this keyword in bold, so it’ll make your listing stand out even more. Think of your meta description like ad copy. You’re persuading your reader to click on your listing over others on the page. You’ve probably heard the phrase “schema markup” before and even seen it in action. Essentially, it’s additional code that helps the search engines better deliver data to its searchers. By implementing schema markup you can make your search engine listings more attractive. This can lead to an improved CTR and more traffic for your website. Your WordPress theme might already have schema markup installed. To see if your site already has schema markup, run it through this tool. If you don’t have schema markup installed, then you can use the Schema plugin. It’s easy to configure and will automatically add schema markup to your site. This spot is effectively position zero so you’ll get more traffic and high click-throughs. But, if you’re already ranking on the first page, then getting this spot will give you two listings in the results. Using images throughout your content will create a higher quality reading experience. This will help keep your users engaged with your site, which will give positive site performance indicators. But, beyond adding images to your site, you can optimize these to improve your SEO too. The image title text isn’t crawled by the search engines, but it can be a factor in your user experience. When a user hovers over your image a pop-up will appear that has your image title text. To change your image title text navigate to your post editor where you’ve placed an image. Hover over the image and click the pencil icon, which will bring up the ‘Edit’ option. On the ‘Advanced Options’ screen, you can then enter your image title. Your image’s alt text will give an indicator to Google what your page is about. In the first image in your post, you should change the alt text to the post’s focus keyword. For other images, use keywords that are variations of your target keyword, or describe the image. To change your image alt text navigate to your visual editor and hover over an image you’ve inserted. Once again, click on the pencil icon which will bring up the ‘Edit’ option. The pop-up box will bring up your image details. Look for a field called ‘Alternative Text’, and enter your focus keyword or related keyword into that box. Your image file name can help your image rank in Google image search, which can bring your site some additional traffic. Most default image filenames are long and confusing, plus they don’t relate to the topic of the post. 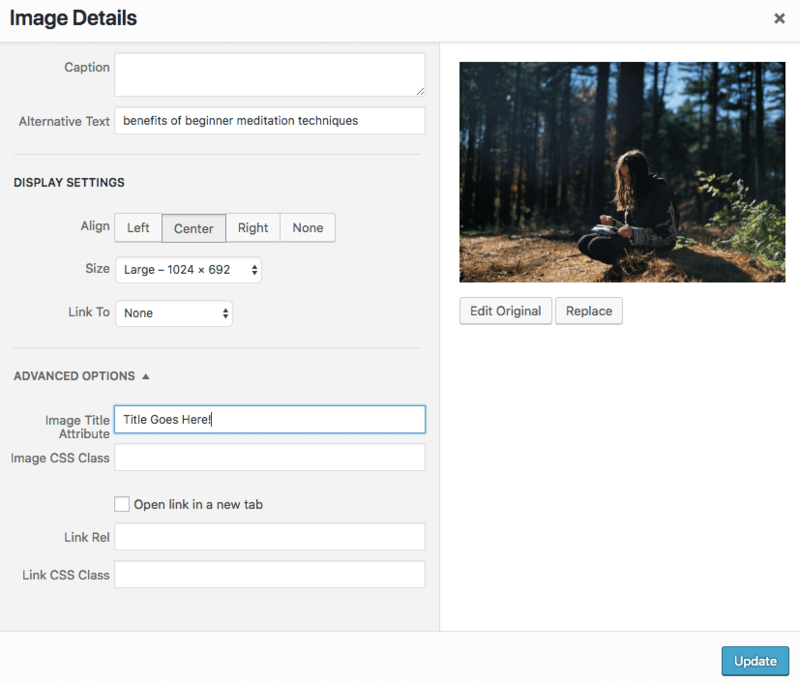 Before you upload an image to WordPress you should consider the purpose of the image, and the keyword phrase you’re targetting. Then include that keyword and other descriptive phrases in your image filename. Also, if you’re using multiple words in your filename make sure you’re using a hyphen between them, as Google will read these hyphens as a space. A lot of websites use affiliate links to generate revenue. These links are used to track commissions when you recommend a product, service, or course. But, using too many of these links is frowned upon by Google. If you’re using affiliate links, then you can disguise them, while making sure they’re no-follow by using a plugin called Pretty Links. Pretty Links is a very useful plugin that can help you give a unique, non-affiliate looking URL, to any links you’re using. As a benefit this tool also has tracking, so you can see how many people are actually clicking your links. 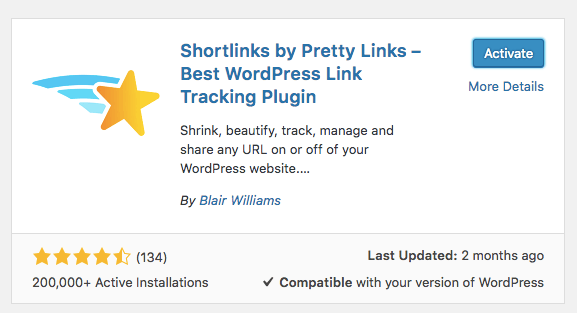 To install this plugin navigate to Plugins › Add New and search for “Pretty Links”. Install and activate the plugin, then navigate to Pretty Link › Options on your left-hand sidebar. To make sure all of your affiliate links are no-follow, make sure to check the ‘Add nofollow to link’ under the Link Defaults setting. You can create a new link by selecting the ‘Add New Link’ option, insert your affiliate URL, and then create a custom one instead. HTTPS is officially a ranking factor, so sites that make the upgrade will have a rankings advantage. It allows your browser to make a secure connection with any website you’re connected to and encrypts any data sent between the two. Make sure that your current host supports HTTPS and SSL. Purchase an SSL certificate, or obtain one through Let’s Encrypt. Install the SSL certificate on your host. Verify if SSL is working. Redirect all of your HTTP traffic and links to HTTPS. The entire process is too technical to walk you through here, but this resource is worth checking out. Backlinks are still one of the top ranking factors. The more high-quality links your site has the better its chances of ranking. According to research done by Matthew Barby, if a page that has a higher number of backlinks it’ll rank higher in the search results. Guest post on popular sites. If you aren’t sure if your site properly optimized, then you can perform an SEO audit. But, instead of going through every step yourself, you can run the site through an SEO auditing tool. These tools will run your site through a series of checks, and you’ll get a report that tells you what you’re doing right and the things you can improve upon. SEOSiteCheckup is a free tool that’ll analyze over 50 different onsite ranking factors and let you know how your site is performing. You can also use the Varvy SEO tool, which will see how well your site is aligning with Google’s guidelines. By monitoring your backlink profile you’ll be able to see if your offsite SEO efforts are improving. 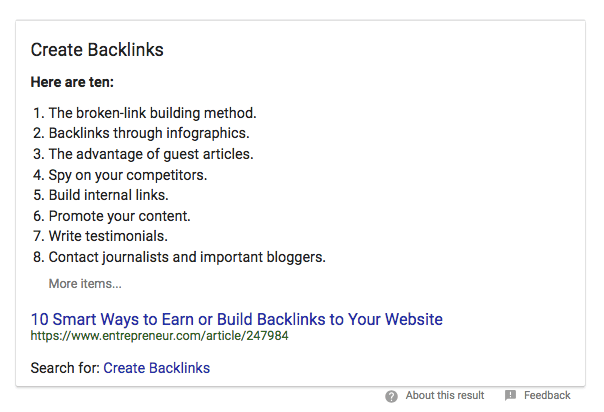 Backlinks are one of the most important ranking factors, so it’s something you’ll want to check frequently. Seeing an upward trend in the number of sites linking to you over time is a good thing. But, remember it’s not just the quantity of backlinks that matter, but it’s the quality and relevance of these links too. The more authoritative and relevant sites that link to you, the better. There are a ton of different tools that’ll help you monitor your backlinks. One of the most frequently used is Ahrefs. This tool will give you a detailed breakdown of the number of sites linking to you, the quality of these sites, the number of referring domains, and a lot more. It is a premium tool, but the data you’ll gain will be invaluable. If you’re looking for a free option, then the tool SEOProfiler might be a good fit. Just create an account, and you’ll be able to get a detailed backlink report on a sitewide and per page basis. Usually, your site is crawled by the frequency you publish new content. But, there is a workaround that’ll get your content immediately indexed by Google. Open up Google Search Console, navigate to Crawl, and click on Fetch as Google. Input the URL of the post you’ve just published or updated and click on ‘FETCH’. Next, click on ‘Request Indexing’ and your new URL will be indexed by Google. Sometimes this won’t happen instantly, but it’ll be much faster than waiting for Google to crawl your site. Depending on your niche, ranking on the top page of Google for the main keywords can be really difficult. Many of them are conquered by veteran pages with content that’s been worked and perfected for a long time. Not to mention a big a profile of backlinks assisting them. In such cases, you’ll need to think outside the box and work your way up by targeting smaller, yet highly specific keywords. These are often referred to as long-tail keywords. For example, try to brainstorm what a potential visitor might look before purchasing a product. Then use a tool such as KWFinder to get a rough estimation of the difficulty and search volume. Make a list of option that could bring the most potential and publish your post while applying all the above-mentioned WordPress SEO tips. This will bring a consistent stream of targeted traffic towards your website. To get the most out of a WordPress site, there are lots of things to consider. Here are a few good reads that will help you improve today! As you can see there’s a lot you need to consider when optimizing your site for the search engines. Hopefully, the post above has been helpful in giving you a great place to start optimizing your site. Finally, remember that SEO is a long-term game. The more effort you put into SEO the more results you’ll see, but typically these results will only come in time. Now over to you. Are there any tips we’ve missed? Have you seen any success from implementing some of the tips in this post? Please share in the comments below.